Jerusalem (AFP) - Israel rejected calls for an independent probe on Sunday after its soldiers killed 16 Palestinians and wounded hundreds more when a major demonstration led to clashes along the border with the Gaza Strip. Israel's military has faced questions from rights groups over its use of live fire on Friday, the bloodiest day in the conflict since a 2014 war, while Palestinians accused soldiers of firing on protesters posing no threat. Both UN Secretary-General Antonio Guterres and EU diplomatic chief Federica Mogherini have called for an independent investigation. On Saturday, the United States blocked a draft UN Security Council statement urging restraint and calling for an investigation of the violence, diplomats said. Prime Minister Benjamin Netanyahu praised the soldiers for "guarding the country's borders," while Defence Minister Avigdor Lieberman said the protests were not a "Woodstock festival". Lieberman said calls for an independent investigation were hypocritical and on Sunday repeated his rejection of such a probe. "There will be no commission of inquiry," he told Israel's public radio. "There will be no such thing here. We shall not cooperate with any commission of inquiry." Netanyahu also hit back at Turkish President Recep Tayyip Erdogan over his sharp criticism of what he called Israel's "inhumane attack" in Gaza. "The most moral army in the world will not be lectured to on morality from someone who for years has been bombing civilians indiscriminately," Netanyahu tweeted. He has previously labelled Erdogan as someone who "bombs Kurdish villagers". Erdogan responded later in the day by calling Netanyahu a "terrorist." 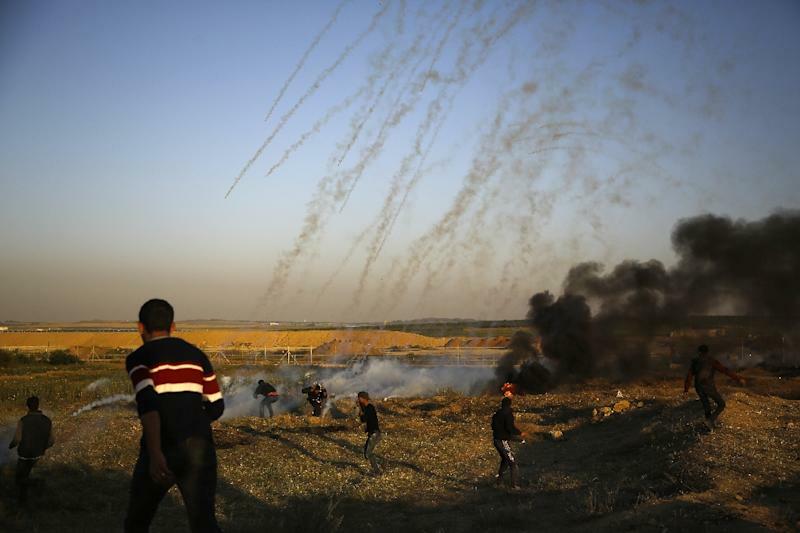 On Friday, Israeli troops opened fire on Palestinians who strayed from a main protest camp attended by tens of thousands and approached the heavily fortified fence cutting off the blockaded Gaza Strip. The military has defended actions of its soldiers and said they opened fire only when necessary against those throwing stones and firebombs or rolling tyres at soldiers. Israel accuses Hamas, the Islamist group that runs Gaza and with whom it has fought three wars since 2008, of using the protest as cover to carry out violence. 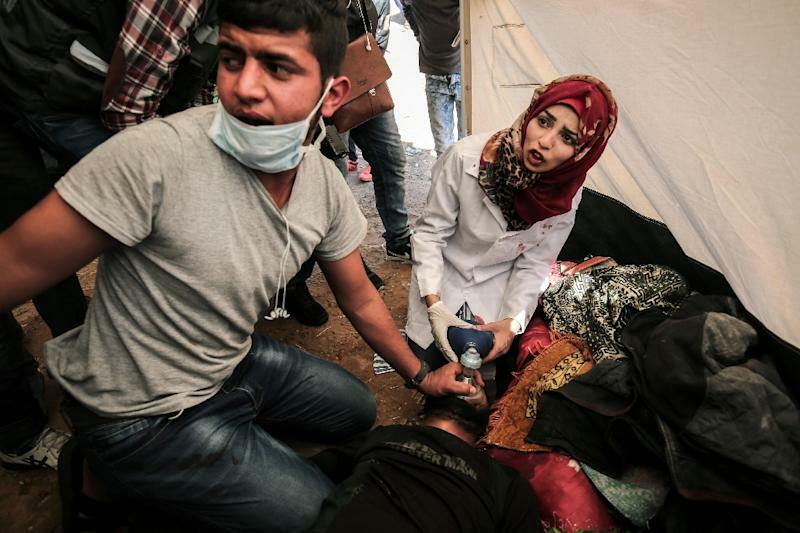 In addition to the 16 Palestinians killed, more than 1,400 were wounded Friday, 758 of them by live fire, with the remainder hurt by rubber bullets and tear gas inhalation, the health ministry in Gaza said. Rights groups including Amnesty International and Human Rights Watch have criticised Israel's use of live fire. In Tel Aviv on Sunday, between 200 and 300 leftwing Israeli opposition demonstrators staged a protest outside the offices of Netanyahu's rightwing Likud party to denounce the government's role in the killings. "The government is doing everything it can to present the Palestinians as the only guilty party whereas it played an important part in the responsibility for what happened," Hagit Ofran of the Peace Now group which opposes Israeli settlement of Palestinian land told AFP. Peace Now issued a statement condemning what it called the army's "trigger happy" policies under orders from the government. The Gaza protests, which include tents erected at various areas, are designed to last six weeks, ending around the time the United States moves its embassy from Tel Aviv to Jerusalem in mid-May. But while tens of thousands attended Friday's start of the protests, demonstrations have since dwindled. Several hundred attended on Saturday, while on Sunday dozens were in the area, with low-level clashes occurring. 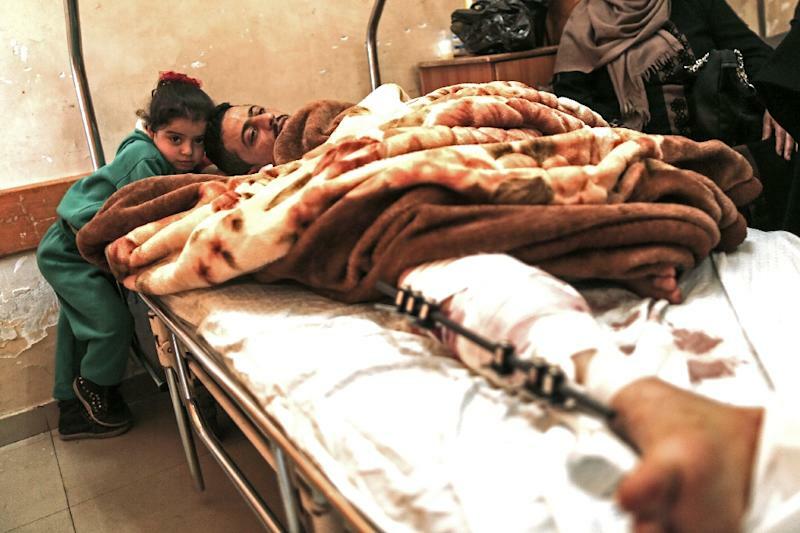 "I left the hospital today and I came straight back," Hamada Zaza, 18 and with a bloodied bandage on his hand covering what he said was a bullet wound, told AFP. The protests may however again see large crowds after this coming Friday's main Muslim prayers and for other key dates ahead. May 14 will mark 70 years since the creation of Israel and is when the United States is expected to open its new Jerusalem embassy. Gaza's protest is in support of refugees, including those in the Palestinian enclave who want to return to their former homes in what is now Israel.